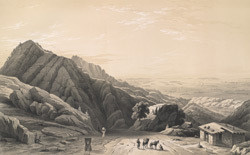 This lithograph is taken from plate 1 of 'Views in the Himalayas' by Mrs WLL Scott. This view was sketched at sunrise from the right-hand side of the road. About 6,000 feet above sea level, Kasauli was the first hill-station on the ascent to Shimla (Simla) in the Himalayan foothills. Once the British had established themselves at Shimla, they developed Kasauli into a cantonment and military sanatorium. Scott wrote: "During the first two miles of ascent, the invalid experiences the most refreshing change, and by the time he reaches Kasauli the air is quite cold." Mrs Scott's mission was to depict well known scenes in and around Shimla, and she therefore travelled to all the stations along the route.